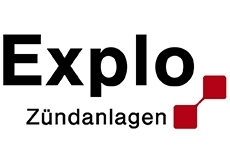 Austrian company specialised in the production of spectacular flame machines running on liquid or gas. All products are produced and controlled from their own factory in Austria. 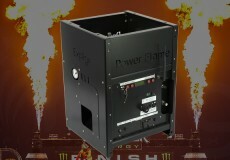 The X2 Wave Flamer from EXPLO is a fluid based flame machine that combines a single movable head with a pressurized fuel source, producing a wide range of flame effects. 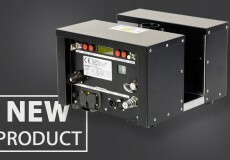 The swiveling head allows the unit to produce very fast and accurate flame surges from 3m to 10m in height within a radius of 210°, controlled by DMX or a wireless option. With the GX2 Gas Projector there are no more limits for the creation of music-synchronized flame pillars and fire balls. Because of its sturdy construction, the gas projector is perfectly suited for outdoor use. The GX3 Hand Flamer is a modification of the GX2 gas projector (stage torch). 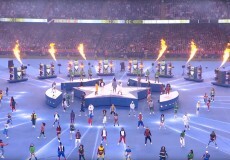 The Black Eyed Peas performed at the Champions League final surrounded by 9 Wave Flamers from EXPLO. 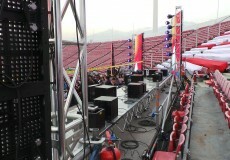 The opening ceremony of the FIFA U-17 World Cup 2015 in Chile was filled with explosive performances in the National Stadium with Explo’s X2 and GX2 flame machines.